The SuperDroid HD2 SWAT/EOD Tactical Treaded Robot is an all-terrain remote-controlled robot designed for defense, EOD (Explosive Ordinance Disposal), law enforcement (tactical, SWAT), security, and surveillance applications. Built like a tank, its sealed (watertight) chassis is made from welded aircraft grade aluminum which is ribbed and gusseted for extra rigidity and strength. The track system is also very robust, using CNC cut rubber treads, composite wheels with 1" thick timed teeth and Polyurethane idler wheels which provides tolerance to changes in temperature, speed, debris, etc. 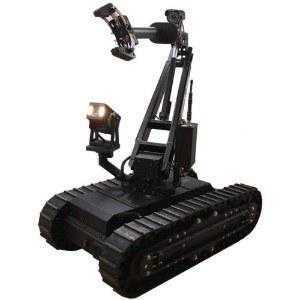 The SuperDroid HD2 SWAT/EOD Tactical Treaded Robot has the ability to climb stairs and go over most terrain. • Housed in a robust Pelican case. • Controls the tracked platform's mobility. • Controls the Pan/Tilt/Zoom on the primary camera. • Controls the 5 degrees of freedom robot arm. • Selectable video feed on the robot (primary camera/arm camera/split screen). • 2 extra channels for optional weapon systems (Tazer, breaching gun, etc.). • Switch for visible LED illumination on primary camera. • RCA video output connector. • The primary camera is a 0 lux Sony CCD Super HAD with 27x autofocus optical zoom. Nitrogen flush system to combat condensation or fogging in extreme weather conditions/transitions. • A secondary camera mounted near gripper is a totally sealed SHARP CCD Infrared camera with integrated IR LED illumination (10 meters).